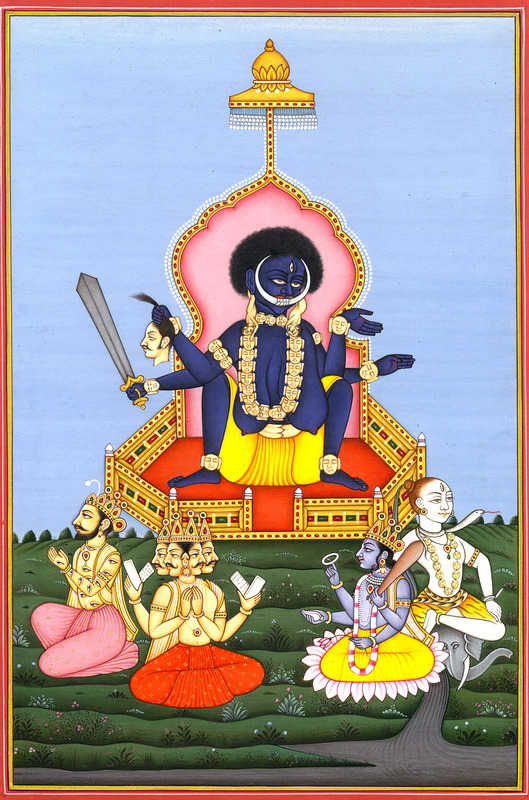 This unique artwork establishes Goddess Kali as the supreme deity. She is shown seated on a throne in a green flowering field. The four principal deities of the Hindu pantheon, Shiva, Vishnu, Brahma, and Indra make up the legs of Her throne. In the foreground flows the river Ganga, which originates from Lord Shiva's hair, who is shown seated on an elephant skin. Next to him is Lord Vishnu, holding in his arms his usual symbols - the mace, lotus, discus, and conch. Next to him is the four-heaed Brahma, and finally there is Indra with multiple eyes on his body. The mighty goddess is shown black though not beautiful in the conventional sense. Her curly, wild hair, small eyes, and the two tusks forming a white crescent moon on her face add to her terrific appearance. Wearing a yellow dhoti and a garland of skulls, her right hands hold a sword and severed head respectively, while the left arms make the gestures of assurance and charity. The posture in which the goddess sits is the classic position of giving birth and is encountered in many images in early Indian art.